In the pantheon of privileged holiday retreats, a few names stand out as otherworldly legendary: Aspen, Rio, St. Tropez, Martha’s Vineyard, Bali and Mallorca — but Budapest? Many would dismiss the Hungarian capital as a Carpathian afterthought, and that’s the first mistake. Others think it’s an isolated, formerly communist victim of crumbling infrastructure and mass emigration, which is the second mistake. The third mistake, naturally, is combining those stereotypes and deciding it’s not worth the time, or money, to visit for as much as a weekend getaway. Few mistakes can be more egregious. A pulsating city of more than two million, Budapest is the kind of old-meets-new blend that’s been proliferating throughout former East Bloc nations. Less than 90 minutes by air from Berlin, it has served as the setting for a mishmash of disparate films, from Underworld, Munich, Hellboy 2 and Transporter 3 to Mission: Impossible – Ghost Protocol, A Good Day to Die Hard and Bel Ami, among many others. The “Pearl of the Danube” has also found itself featured in music videos by such artists as Michael Jackson, Katy Perry, Selena Gomez, Gwen Stefani and Lenny Kravitz. This city has glitz. It has glamour, salaciousness, yet sophistication; a chance to feel like a jet-setting hotshot without paying jet-setting hotshot prices. This is Budapest — perhaps the most underrated city in all of Europe. Airplane wheels down, it was go time. Stepping off my EasyJet flight, I threw on my sunglasses and fixed the collar on my crisp white linen shirt while smoothing out my tailored single-breasted notch lapel Joseph Abboud suit jacket. Benjamin Bond had landed. I moseyed out to the reams of waiting taxis. “Jó napot (good afternoon),” I said coolly to the middle-aged driver in a bowler-style hat. “Vigyen kérem a Hotel Gellért (take me to Hotel Gellért, please).” I’d never been to Hungary before, but I’d done my research. “Igen (yes),” came his reply. We sputtered off in the fading yellow contraption with an immediacy nigh impossible to find in New York. Budapest may have a bit of a reputation for being laid-back, but its cab drivers are not. Art Nouveau and neo-Gothic structures whizzed past at dizzying speed as we snaked through the busy streets close to the legendary Danube River. The cab lacked air conditioning, but the breeze generated from both the river and the sheer speed of our travel provided comfortable regulation. The Romans first colonized Budapest about 2,000 years ago, making it a regional capital and naming the area “Aquincum” in reference to the numerous natural thermal springs. The Huns left their mark (mainly by driving out the Romans around the fifth century and proceeding to pillage the area through a near-endless series of battles), as did the Tatars (whose successive attacks inspired the populace to erect defenses all across the Danube), Turkish Pashas (who built the first baths that would later be improved upon and for what today Budapest is best known for), and the House of Habsburg. And the city, which acquired its name when the rival cities of Buda and Pest merged into one, wasn’t one of the most important in the Austro-Hungarian Empire for nothing (i.e. well-defended and with easy access to the all-important shipping lanes on the Danube). The end result: stunning scenery that not only rivals, but ultimately puts Paris or the best of Italy to shame. This rich legacy has endured despite World War II-era Nazi occupation and the harsh rule of the former Soviet Union, including the violent 1956 Hungarian Revolution that resulted in the deaths of more than 3,000 Hungarians and Soviet troops, creating a feast for the eyes as sumptuous as the goulash soup Hungary is famous for. The minutes passed quickly as we soon reached our destination. The New York Times once claimed the neo-Gothic Hungarian Parliament building “looks like one very creepy church, or perhaps the corporate headquarters of Vampires Inc.,” but really that distinction goes to Hotel Gellért. Given my multiple encounters with vampires over the past year (GALO accounts of which can be seen here and here), I felt like somewhat of an authority on making such a statement. Handing the driver several thousand forint (an amount a lot less than it seems, as one euro is equivalent to more than 250 of Hungary’s national currency), I strode into the ornate lobby that by itself sets the Gellért apart as the finest in the country. Dark red carpeting offsetting a massive arched ceiling, the palatial room is more royal palace than hotel, as much a statement as it is appealing in its interior vistas. Multiple layers of rounded balconies give it more of a rotunda feel, and I realized this wasn’t the headquarters of Vampires Inc. at all, but rather the Vampire Parliament. 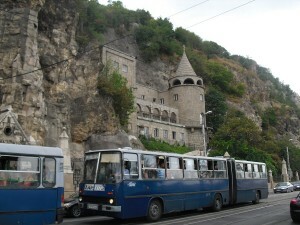 Especially popular with visiting Indian Maharajas before World War II, the Gellért is accustomed to celebrity. Built between 1916 and 1918 with a towering glass cupola and wrought iron embellishments, since 1997 the international literary prize, the Balint Balassi Memorial Sword Award, has held its award ceremony at the hotel. I was no poet or translator of Hungarian literature, but I waxed near poetic when I sauntered to the front desk. She said something in Hungarian. It sounded like “Yes, we do,” but I wasn’t sure. “Yes, of course I do.” Bingo. The young-looking woman with angular features and a high aquiline nose common among ethnic Hungarians smiled. “You speak some Hungarian,” she said, the slightest hint of admiration in her voice. “Dorina.” The name, derived from the Greek Doris and meaning “Gift from God,” is among the most popular in the country. “Pleased to meet you.” Her sharp accent was the perfect blend of sensuality and curtness. A pause — I felt comfortable tension building. “Do you have a reservation?” she inquired. “No,” I told her. “It’s a spur-of-the-moment thing.” I’d only been planning the trip for a few days, so it was a half-truth. I hoped my suit would make it seem more believable. It worked for politicians, corporate CEOs, and certain New York City mayoral candidates, anyway.